Horizon Square apartments in Laurel, Maryland, are close to everything you’d ever want or need and just a short hop to DC, Baltimore and Annapolis. 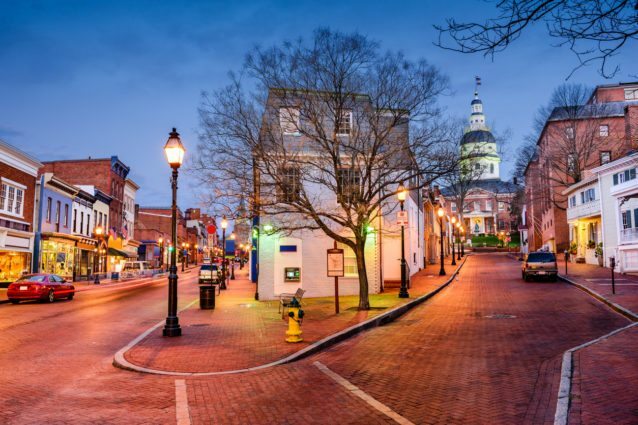 Annapolis, just a 30 min drive from Horizon Square Apartments, is the ideal location for a day trip with the family. There are so many places to see and things to do in the area! At Horizon Square Apartments, you can explore new destinations and then come back home to our cozy apartments in Laurel, Maryland. “I can always find something here! I prefer to come during the week if possible to avoid crowds. I love that crate and barrel and pottery barn are in this mall. There are also plenty of places to eat! The layout takes some getting use too but really as all malls go it is pretty cool and has something for everyone.” – Stacey E.
“I had a business meeting in the area and dropped my wife and daughter off so they could shop. Very safe, clean and highly attractive area. They were there for 3 hours and we’re not ready to leave when I came to pick them up. A number of high-end shops. Fully recommend this for shopping.” – Rod M.
“Annapolis Town Center is one of the nicest areas I have been to in a while. I call in love with it at first site. Various stores and shops, and restaurants from every type of food you could think of. A great place to visit.” – Jasmine B. “This was our third annual trip to Annapolis, and also our third annual trip to Miss Shirley’s! We LOVE it here. It’s nice and casual and you’ll surely (no pun intended) be overwhelmed by the massive amounts of choices on the menu. I’ve regrettably only tried the breakfast foods, but they’re too good to pass up. This time I had the chocolate chip pancakes which were perfect. The service is always friendly, attentive, and informative. We’re early birds so I’ve never experienced a wait, but I would imagine the place to get packed.” – Jillian T.
“Incredible fish and chips and corned beef that’s out of this world. Great atmosphere as well. Completely authentic Irish pub.” – Mark C.
“Wow this place. Noah was our server and he was absolutely amazing. The service was top notch and the food was incredible. I had the fry chicken Benny. And wow! It was amazing! Coffee was awesome too: will definitely come back when visiting Annapolis again.” – Andi B. “We visited in May and enjoyed a fabulous tour led by a super knowledgeable docent (Carol). This is a piece of American History preserved in time. If you love architecture, you’ll love this place. A must see in Annapolis!” – Jamie W.
“They have great docks. You can even fish there. There are lovely fish in the museum. The staffs are very enthusiastic and show warm hospitality.” – Yi A. “This was a very comprehensive and extensive Museum that highlighted all aspects of the United States Naval Academy. I spent hours there enjoying all of the exhibits. I especially like the exhibit that highlighted the battles and how they were specifically fought back in the late 18th and 19th centuries. There were multiple floors filled with awesome exhibits highlighting all parts of the history. Definitely worth a visit and prepare to spend some time there!” – Chad P.
After you’ve enjoyed your day trip to Annapolis, come home to our apartments in Laurel, Maryland, where you’ll be entertained by our great amenities along with the many great places nearby. Stop by for a tour today!